Cricket: The Australian Way. (Foreword by Sir Donald Bradman). In Quest of the Ashes 1934. 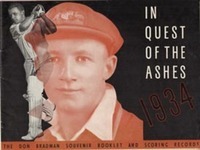 The Don Bradman Souvenir Booklet and Scoring Records. Cricketers' Annual for 1896. With which is Incorporated "James Lillywhite's Companion and Guide to Cricketers". Twenty-fifth Year of Publication. .. The Grand Old Ground: A History of the Sydney Cricket Ground. 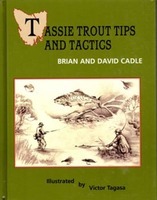 Tassie Trout Tips and Tactics. Ballarat Fish Hatchery:- A History. The first 117 years. Trout Fishery of Tasmania. Vol. I: 1865-1910. Fly Fishing Fundamentals. An Introduction to Fly Fishing for Trout. No. 75. For the year 1938. Ed. by W.H. Brookes. 1974-75 MCC Tour of Australia. Ed. by Alan McGilvray. The Greats of '48: As seen by Ray Robinson who toured with team. A History of the British Sea-Anemones and Corals. (Actinologia Britannica). Tales of the Angler's Eldorado New Zealand. A History of Quirindi. Edited by K. Goodwin. Assisted by J. M. Copeland and T. Latham. BRADMAN D. (By A.G. Moyes). England v. Australia 1912. With 3 Plates. The Berkelouw family has traded in books for generations. Read about our family history. Berkelouw have years of experience in providing books for interior decoration, retail and corporate displays, film, theatre and commercials. We offer a comprehensive range of book binding & repair services. Achieve higher prices than you may at auction and sell your books to us.